Go to apps, select Browse Apps, and then select All Apps. Select MLB.TV to download the app. When the download is complete, the MLB.TV app will start, and you can browse and watch any free content. To watch premium content you will need to sign in using your MLB.TV Premium subscription login credentials. 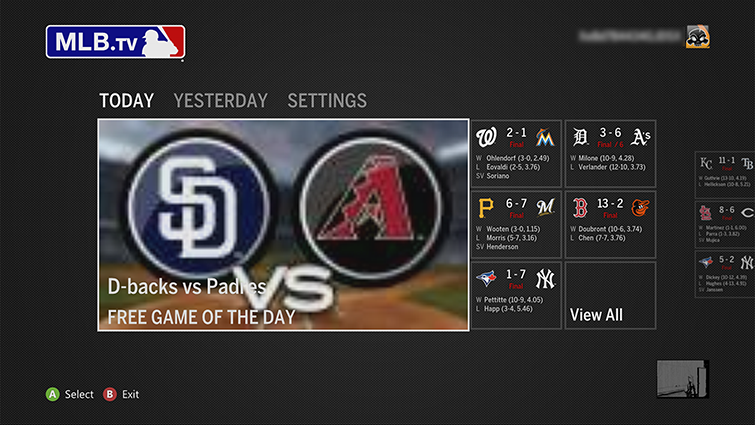 To start the MLB.TV app later, go to video, My Apps and then MLB.TV. You must be an MLB.TV Premium subscriber to access MLB games on your Xbox. Go to MLB.TV on Xbox Live to purchase MLB.TV Premium. Blackout and other restrictions apply. On your Xbox 360 console, sign in to your Xbox Live Account. Select a video to watch from the MLB app home screen. You’ll be prompted to sign in to MLB.com. Note You can also navigate to the Settings hub and select My Subscription Only tile to begin the sign-in process. Select I have a Subscription from the MLB.com Account Management screen. If you are not currently an MLB.TV Premium subscription subscriber, do the following. Otherwise, go to step 6. On your computer, go to mlb.com/xbox. Select the MLB.TV Premium package that you want to purchase (annual and monthly subscriptions are available). After you complete the subscription process, return to your Xbox console and complete step 6. Enter the email address and password for your MLB.com account, and then select Sign-in. You will now have access to MLB games on your Xbox. Go to TV & Movies, select My Video Apps, and then select MLB.TV. From the Today hub, you can watch any live game in the league. Or, go to the Yesterday hub to browse games from the previous day. Note You must be an MLB.TV Premium subscriber to access MLB games on your Xbox. Go to MLB.TV on Xbox Live to purchase MLB.TV Premium. Blackout and other restrictions apply. If you have an issue with any of the content in this app or your ability to access a game, please contact MLB.TV by visiting MLB.tv/xbox and selecting Help from the upper-right side of the browser window. Would you like to contact Support regarding the "Set up and use MLB.TV on Xbox 360" issue you were reading about or a different issue?